Sign up for Broadjam today to follow Cecile Doo-Kingue, and be notified when they upload new stuff or update their news! Born and raised in NYC, first generation from Cameroon, educated in the French system, Cecile Doo-Kingue stems from a meeting of cultures, which is reflected in the eclecticism of her music. As a side woman, she has backed and recorded with such artists as Montreal Jubilation Choir, Ismael Isaac, Sister Sledge, Bernard Purdie, Lou Simon, Corneille, to name but a few. Her original project Dibondoko, participated in many international festivals, including Festival International de Jazz de Montreal and Festival International Nuits d'Afrique, where the band opened for both Manu Dibango and Youssou N'dour. 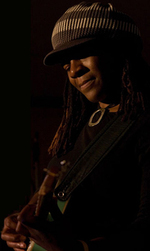 Behind the scenes, Cecile has mixed or produced several albums including the United Steel Workers of Montreal's first two albums, as well as Dibondoko's album Dibondoko. She currently plays with Tricia Foster, Lou Simon and Graham Chambers. Cecile's debut solo album is expected for early 2009.